Navigate: StoreFront / Package Deals / Kits / Engine Performance Kits / VAC S14 Performance Tune-Up Kit, "Stage 1"
The Stage 1 kit is the start to performance in the E30 M3. These are the two most cost effective upgrades you can do to your M3 with no down sides! Your M3 will increase output drastically over stock: Over 20+ Dyno proven Wheel HP with no extra strain, noise, or driveability issues! You will even gain better cruising gas mileage, better engine response, and smooth out power throut the RPM range. 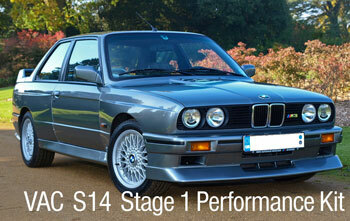 Our outstanding and exclusive VAC performance software and the OEM Evo flywheel make an excellent "Stage 1" upgrade to your E30 M3. So good, every E30 M3 owner should have these modifications. Save $100 by purchasing this kit!